(New Delhi – 15 November 2016) Rado, the Swiss watch brand known for its innovative use of design and materials, officially launched its lightness-inspired collection at the newly opened boutique in Noida. 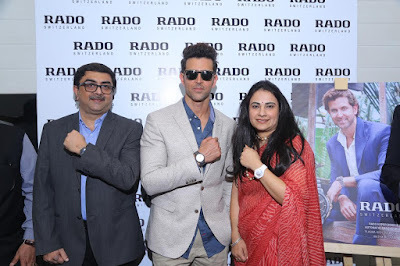 To mark the launch of its boutique and the new collection, Rado brand ambassador and beloved Bollywood star Hrithik Roshan made an appearance at Mall of India, Noida, home to the brand‟s latest boutique. Many of Rado‟s latest standout pieces have been crafted from the brand‟s signature material, high‐tech ceramic, which is one of the lightest and most durable materials used in luxury watchmaking. The designs are light and atmospheric as well: The True Open Heart, with its diaphanous mother‐of‐pearl dial, evokes feelings of weightlessness, while the new True Thinline timepieces seemingly float on the wrist with their restrained lines and ultra‐slim profiles. By far the lightest in the collection, the HyperChrome UltraLight is crafted from a trio of featherweight materials: silicon nitride ceramic, hardened titanium inserts, and a movement with anodized aluminium bridges. There are non-ceramic highlights too: the HyperChrome 1616, for instance, truly breaks new ground in comfort and durability with its use of a new titanium hardening treatment. This treatment makes the titanium 5 times harder than watchmaking steel while being only half its weight. The new collection is on display at the Rado boutique, F-184, Ground Floor, DLF Mall of India, Noida. It is open 7 days a week from 11:00 a.m. to 8:30 p.m.
Purchase your authentic brand watch at a 75% discount online at Jacob Time.